A stylish and practical gift bag for any new or new again parent! This includes a beautiful Bear and Finn Soy hand poured candle in a glass jar with a bamboo lid 340g(scent will vary). 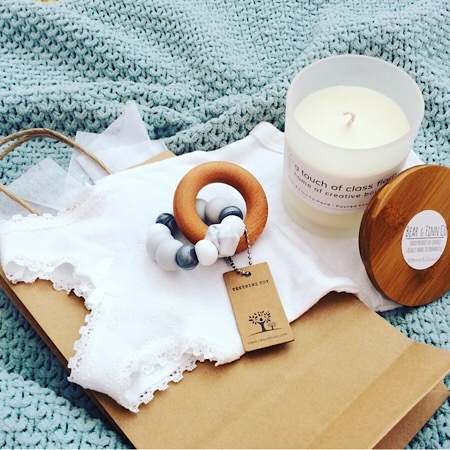 A Nature Bubz teething toy in Dove Grey colours. These teething toys are both safe and stylish and the perfect addition to any parent’s kit. As well as a baby’s body suit (colour may vary but will be appropriate for each baby). These gifts will be packaged in a beautifully presented craft gift bag and appropriate ribbon! Choose the Deluxe value to add a beautiful jam jar of flowers to this gift!